Tossy Spivakovsky (Nathan Spivakovsky) was a Russian (Ukrainian) violinist and teacher born (in Odessa) on December 23, 1906. He belongs squarely in the era of individualistic virtuosos born (mostly) in the first half of the Twentieth Century – the era of Kreisler, Kogan, Elman, Milstein, Thibaud, Grumiaux, Spalding, Zimbalist, Suk, Brown, Gitlis, Huberman, Hartmann, Haendel, Heifetz, Oistrakh, Ricci, Rabin, Ferras, Francescatti, and a few others. By 1990, most of these players were dead. 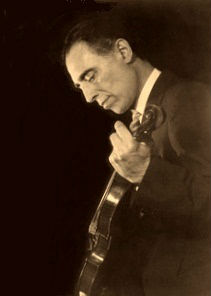 It has been said that Spivakovsky was a “highly eccentric violinist with an unconventional bow and violin hold.” For many years, Spivakovsky had a very successful solo career, though he was not among the virtuosos who studied with Leopold Auer, Peter Stolyarsky, Abram Yampolsky, or Carl Flesch. He studied in Berlin with Willy Hess at the Royal Academy (Advanced School for Music) and gave his first public performance at age 10. At age 13, as soon as World War I ended, he toured Europe for the first time. At age 18 (1925), he became concertmaster of the Berlin Philharmonic. He spent a year there (one usually-reliable source says it was two years) then left to pursue a career as a soloist. Also in the 1920s, he – with his older pianist brother Jascha – formed the Spivakovsky Duo. In 1930, he played and toured with the Spivakovsky-Kurtz Trio. In 1933, the trio found itself in Australia where it (rather spontaneously) decided to stay because of the political changes then taking place in Germany. Spivakovsky took a teaching position at the University of Melbourne, as did the other two members of the trio – Jascha Spivakovsky, pianist, and Edmund Kurtz, cellist. In 1940, Spivakovsky came to the U.S. He was 34 years old. Interestingly, Spivakovsky had two other (older) brothers who were accomplished musicians – Isaac and Adolf – who had joined him in Australia in 1934. They (and Jascha) remained in Australia when Spivakovsky emigrated to the U.S. That same year (1940), Spivakovsky made his debut in Town Hall (New York.) After some concertizing activity, in 1942, he was appointed concertmaster of the Cleveland Orchestra. While serving as concertmaster in Cleveland, he gave the U.S. premiere of Bartok’s second concerto (1943) in one of its programs. On October 14, 1943, he gave the first New York performance of the same work with the New York Philharmonic, an orchestra with which he appeared more than 20 times. Bartok himself said his playing of the concerto was first rate. Wherever he played, he received extremely favorable reviews. With the New York Philharmonic, he performed four concertos which never became part of the standard repertoire – those by Gian Carlo Menotti, Roger Sessions, Carl Nielsen, and Frank Martin. Spivakovsky stepped down from his Cleveland post in 1945. His interpretations have been described as highly personalized, meaning that he put his temperamental (some would say idiosyncratic) stamp on everything he played. A few YouTube audio files bear witness to this. One of them is here. His playing of the Tchaikovsky concerto is done in a manner unlike anything I have heard before. As an added bonus, in the C major passage which immediately follows the re-statement of the main theme by the orchestra (about 8 minutes into the first movement), Spivakovsky plays the repeat of the variation-like section an octave higher. I know of only six other violinists who do this – Jascha Heifetz, Erick Friedman, Konstanty Kulka, Jane Peters, Andras Agoston, and Leila Josefowicz. You can listen for yourself here. Spivakovsky concertized extensively in Europe, the U.S., and South America for about four decades. Most of his recordings were done between 1925 and 1960 but they are few and far between - most are still available. He taught at Juilliard (New York) between 1974 and 1989. He was 68 years old when he began teaching there and 83 when he retired. As far as I know, he had no famous students. An explanation of his unorthodox bow hold was published in a book in 1949. Spivakovsky was known to conduct extensive research into original editions of music to get as accurate a picture of composers’ intentions as possible. His violin was a 1769 G.B. Guadagnini. I don't know what became of it. He also published an essay on Bach’s unaccompanied violin Partitas in 1967. His ideas were not widely adopted, but that’s putting it mildly. Spivakovsky died (in Westport, Connecticut) on July 20, 1998, at age 91.